The international discussion on Trump’s dispute over import tariffs for steel, aluminum and even cars is currently focused on the big global players. However, African countries will suffer severely from these punitive tariffs. After years of talk of partnership for African economic development (AGOA, Cotonou Agreement, EPAs, etc.) Trump’s tariffs mean a severe blow to participatory African trade and sustainable industrialization. Egypt and South Africa for example, potentially the most affected countries in Africa, face massive job losses and diminishing earning opportunities, with all the consequences that this entails for their already fragile economies and populations in dire poverty. At least since the derogatory comments in January 2018, in which Donald Trump described African states as ‘shitholes’, the importance he attached to Africa became clear beyond doubt. Evidently, from his point of view, America’s greatness is based on spheres of influence other than Africa. Even though Africa and the African diaspora contributed significantly to the making of the United States and contribute to its development today. Trump prefers to concentrate on global competitors, such as China, Canada, Russia and Europe in order to ‘put America first again’. In absolute terms Trump may be right. The extent of imports of steel and aluminum from Africa might be negligible in relation to overall imports and its supposed negative effects on employment of US white working-class in Rust Belt states. Trump targets states such as Pennsylvania, Michigan, Wisconsin and Iowa, which he regards as the clientele of his republican vote. However, Africa is far more dependent on overseas trade than other economic regions and global players, such as the EU or North America that handle 63 percent and 40 percent respectively of their business with their regional neighbours. The major reasons of Africa’s dependency are the fragmented intra-African market, decades of stagnant regional and continental integration, high transaction costs, and corresponding tariff and non-tariff barriers to trade. Most of these barriers are at least partially due to rival neo-colonial foreign trade networks of anglo-, franco- and lusophone African countries, like the ‘closed shop’ of the notorious French business-network of the ‘Messieurs Afrique’. Africa’s infant industries rely heavily on foreign trade in view of the continent’s limited local and regional markets. Intra-African trade accounts for far below 20 percent of total African foreign trade. The Pan-African Free Trade Agreement (CFTA) that was recently negotiated on a special African Union summit in Kigali (Rwanda, 21 March 2018) by 44 African states is not likely to change this situation in the foreseeable future. CFTA is supposed to liberalize intra-African services completely and 90 percent of trade in goods. Yet substantial problems remain, so the common external tariffs have not yet been negotiated because of existing agreements under the controversial EU-Africa trade agreements, and finally some major players, for example South Africa, Nigeria and Uganda, have not yet even joined the CFTA. Importantly, unfair trade relations to the disadvantage of the continent have overshadowed African foreign trade since colonial times. Africa is still integrated asymmetrically into global trade. Raw material and agricultural exports on the one hand and capital goods imports on the other continue to dominate African foreign trade. One of the origins of Africa’s current inability to benefit fully from the expansion of world trade lies in the colonial division of labour, the consequences of which persist in economic structures far more than in other continents. Under these conditions, the free trade ideology of the Bretton Woods Institutions, propagated for decades by the Structural Adjustment Programs of the IMF, conserved the status quo rather than generating sustainable African growth. These tendencies have been exacerbated in recent decades as Africa’s commodity prices have fallen in international markets since the 1970s, and consumer prices have risen. All this makes for the volatility of African foreign trade relations that will be further aggravated by Trump’s tariffs. Yet, Africa is mostly ignored in the international discussion about the effects of Trump’s protective tariffs on steel (25 percent), aluminum (10 percent), cars and other imports. African countries like South Africa, Egypt and Rwanda have little power to retaliate, unlike the EU or China. Though Trump wants to enforce ‘good behavior’ on trading partners on the continent in order to ‘make America great again’. So, his administration took extreme steps against Rwanda this year for taxing second-hand American clothes in an effort to protect its infant textile industry – the country was suspended from duty-free access to US markets. Steel production (in 1,000 tons) in the USA in January 2018 was 6,822, i.e. about ten times as high as in Egypt (660) or South Africa (577). Other major African steel exporters like Libya (48) and Morocco 45 (August 2017) were far behind in third and fourth place, respectively. Worldwide, South Africa and Egypt rank 22nd and 27th globally in steel production, that is, far, far behind China, the world’s largest steel producer, with 808.4 million metric tons or 50 percent of world production. Still, barely 2 percent of the steel imported into the US last year came from China (see S&P Global Platts, New York, 4 March, 2018). Levels in aluminum were a bit higher, but not particularly significant either. The vast majority of Chinese steel shipments went to other countries. Trade diversion as a result of Trump’s protective tariffs could lead to cut-throat competition with respect to the infant African steel industry. However, compared to the US, China or Europe, the metalworking industry in African countries, such as South Africa, Egypt and Nigeria, has a significantly higher importance for its domestic economy and sustainable growth. In total, the manufacturing industry in South Africa had 1,213,560 employees in 2014, of which the largest share was in the metalworking industry, employing approximately 257,098 or 21 percent of the workforce. In Egypt, the total number employed in the industry in 2015 was 25 percent of all economic sectors, with its steel industry considered to embody the nation’s economic resilience. African states still strive to cope with the legacy of the slave trade, colonialism, and the subsequent struggle for political and economic independence in a crisis prone world. Decades of development aid and well-intentioned though not necessarily altruistic treaties to promote development by trade, like AGOA and the ACP-EU Cotonou agreement which runs out in 2020, were regarded as steps in the right direction, though they actually had little impact and failed to accelerate development on the continent. The present move of the Trump administration to put ‘America first’ and to concentrate on the United States’ ‘real friends’, is a step backward. There is even a whiff of the period in the cold war, when, according to the maxim, if you’re not with us, you’re against us. The punitive tariffs introduced on imports from African countries is a harsh and blunt power without regard to the needs of developing countries on the continent, or elsewhere. Yet, unlike competing global players, targeted by Trump, African countries lack the power to retaliate. It is another slap in the face to those on the continent who thought there would be a more level playing field with the US, at least since the AGOA-treaty and the dashed hopes once aroused by the Obama-administration. Dirk Kohnert is Associated Senior Expert at the Institute of African Affairs (IAA), German Institute of Global and Area Studies, Hamburg, Germany. He is also the retired deputy director of IAA (1991-2011) and former editor of the journal Africa Spectrum. If you are interested in learning more on the impact of Trump’s tariffs on Africa, then we will be publishing a full Briefing by Dirk Kohnert in the next issue of ROAPE. 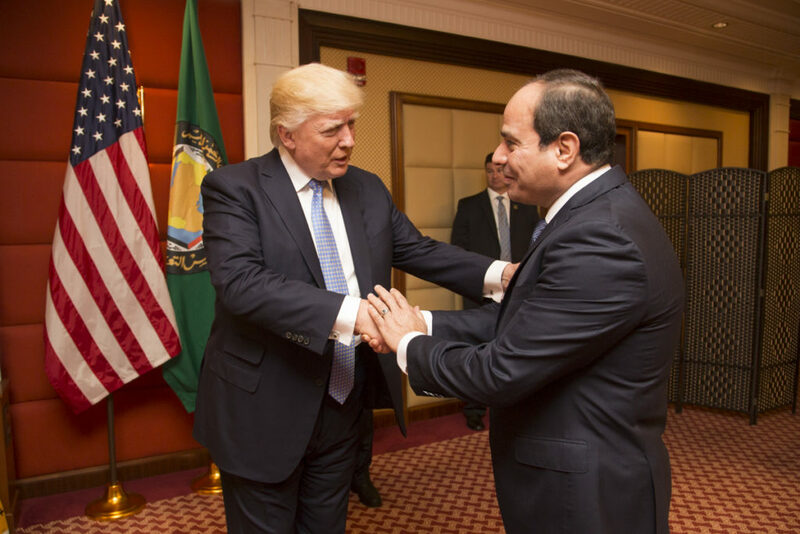 Featured Photograph: Donald Trump greets Egypt’s President, Abdel Fattah Al Sisi, at the Ritz-Carlton Hotel in Riyadh, Saudi Arabia (21 May, 2017).